Christened ‘Natural Star’ by his fans, Nani is the messiah of hope for youngsters everywhere with dreams in their eyes and nothing else to back them. Any individual who’s interacted with Nani will tell you that he is truly deserving of his position as a role model. He is equal parts intelligent, charming, talented, and of course handsome. His creative quotient is far superior to us mere mortals and his quick wit is unlike any other. Speaking to Nani even during what is possibly one of the most stressful times for any individual (such as just before the release of their film; in this case Krishnarjuna Yudham) is a delight as he lights up any conversation. In-keeping with his upbeat and sharp personality, we decided to go for an entirely new approach to his interview. 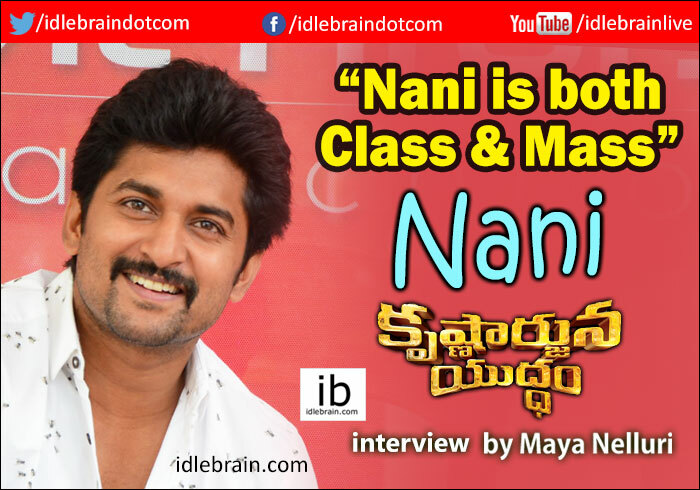 Get ready for rapid fire with Nani. What is your favourite song from KAY? Krishna or Arjun? Who is your favourite? Both but I think that the crowd will favour Krishna more because he is more mass whereas Arjun has a more class touch. Are you naturally more classy or massy? A bit of both. It actually depends on the company. When I am with classy people then that side of me comes out. If the people around me are more mass, that side comes out. How was it playing dual role? Very different actually. I’ve done dual role films before but I did not have many scenes where both characters were in same frame. This film had a lot of work like that so it was quite challenging but now that I see the final output it’s quite rewarding. Oh! How does that work out for shoots? Shoots get me excited because of the content what I’m doing. That helps me. If I’m not shooting it’s very difficult for me to wake up. In fact if it is for anything apart from shooting it is difficult. Only shoots can wake me up in the morning. Nothing else can. If a movie was made of your life, what genre would it be? I guess a bio pic is a genre in itself. But if I had to choose something else it would be more of a success story kind of genre where there is soul searching. It’s definitely not comedy and not action obviously. There is a love story also and there is a bit of everything. In cinema terms it falls in a commercial genre because it has all the highs and lows. What is your favourite movie quote of all time? “With great power comes great responsibility,” from Spiderman. Rangasthalam and I loved it. What is your favourite Indian location for holiday? What is your favourite international location for holiday? Prague. I just realised how beautiful it is when I shot for KAY and I completely fell in love with that place. If I get a chance I want to go back. Who would you say is your strength? Do you prefer chocolate or vanilla? Are you a coffee person or tea person? What can we look forward to from you after KAY? My next film! Which is with Nag sir. It will be very interesting. We’ve already started shooting for it and it’s shaping up well.